In ordinary use, the word experience, whether as a noun ("My wife had a wonderful experience") or as a verb ("I experienced much pain"), implies an experienceer. "Someone" in a particular situation "had" an experience. The situation gave rise to or produced an experience affecting the consciousness and the state of wholeness of a being. This being existed as an organismic whole before the situation occurred which affected him or her as experiencer. Though he or she may be affected by what took place, the experiencer is believed to retain his or her identity outside the situation which gave rise to the experience. What is considered "the same" situation may be experienced differently by several entities, each reacting to it in a particular manner according to his or her nature and character. Likewise, the same person may be assumed to have different experiences arising from different situations. In all cases the fact that an experiencer considers an experience as "his or her own" implies the seemingly incontrovertible feeling of existing outside the experience, even if the latter deeply modifies the state of being with which the experiencer had until then identified himself or herself — his or her self-image. From the point of view of the philosophy of Operative Wholeness, and also according to the anatma doctrine constituting the foundation of Buddhist thought (at least in its public aspect), no situation is ever the same. There is likewise no experiencing subject having a separate permanent being as an atman outside the situation he or she experiences. Situations always change, and so does the subjective factor inherent in them. In ancient Greece, before Parmenides apparently introduced the dualistic notion of being and becoming — a notion which has plagued Western civilization ever since — Heraclitus had asserted that no one crossing a river at different times experiences the same water. But in the same century, the Buddha taught in India that the person who at different times enters the ever-flowing stream is also not the same person. All situations, understood as successive phases of the Movement of Wholeness, are different. Each phase of the relationship between the principles of Unity and Multiplicity makes a different type of situation possible. But because the principle of Multiplicity is active, one type of situation may produce a great diversity of experiences in a variety of environmental conditions — each environment or ecosystem containing numerous living organisms able to experience the situation. 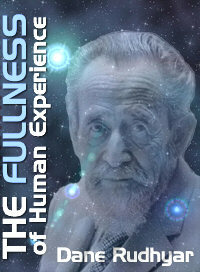 However, in order for an organism to experience, the wholeness of the whole has to focus itself. It has to become at-tentive (i.e. to develop a state of "tension toward" an imminent or already unfolding situation). The consciousness aspect of wholeness must condense itself into a subjective factor in the experience. This subject may either accept or refuse the experience. The refusal of an experience, however, engenders a negative situation which in many instances eventually has to be harmonized by the operation of karmic "tensions" needed to compensate for or neutralize the previous lack of "attention." The deepest roots of karma are indeed the result of what is not done, rather than of a disruptive action. The most basic failures are the failures to act when a situation presents itself as the new phase of the cycle of being which demands that an unfamiliar step be taken. The refusal to act and to experience may have one of two fundamental causes: the memory of a similar experience which had been oppressive, painful or frightening, or a feeling of impotency producing an expectation of failure. In the first case the memory factor has its source in mind. This may be the mind of the individual person faced by the situation and remembering one or more similar events, or the collective mind of a culture, a particular religion, or social class that impressed forcibly upon the personal mind a doctrine or a particular way of life which excludes numerous possible responses to rigidly defined situations. In the second case, the lack of attention (or even more, the sense of not being able to rise to the occasion) has its roots in some organismic lack — thus in an ineffective presence of Wholeness, and (at the biological level) the absence of vital energy. Consciousness, as an operative aspect of Wholeness, condenses itself into a subject when an organized whole accepts to experience the confronting situation. Acceptance may be based on the memory of a similar experience which gave pleasure and enhanced the power of expansion and self-multiplication inherent in the biological and psychic whole. Acceptance may also be motivated by an exuberance of power, whether at the biological level or that of sociocultural relationship with other persons or with a social environment. At the prehuman and strictly biological level of evolution, the possibility of acceptance or refusal does not exist insofar as a particular plant or animal is concerned. The subjective factor resides in the whole species rather than in any of its specimens. Any specimen is indeed expendable. The survival, welfare and expansion of the species as a whole is the only important (or at least the essential) motive. If an evolutionary mutation is required, it takes place in the seed. The seed belongs to the species, not to any particular specimen. It is a genetic factor, even if the mutation is induced in the species-as-a-whole by the experiences of some particular specimen (or a group of them) having been confronted with and successfully meeting a radically altered life-situation. Only at the level of truly "human" situations is a basic choice possible on an individual basis. Even at that level, for a long period of human evolution, the individual character of the choice is only a latent possibility. It is latent within the collective structure of beliefs and ways of behavior which any culture imposes upon a child from birth, and which he or she has to unquestioningly accept. Indeed, for years the child has to operate within the collective matrix of the culture and the societal way of life almost as compulsively as a foetus within the biological womb of the mother. His or her individuality is only a potentiality. In order to operate as an "individual" in relative freedom, the child (or in traditional societies, the adolescent) has to detach his or her subjectivity from the collective subject which had for many years dominated and in most cases still largely dominates the latent subjectivity factor in his or her experiences. The detachable character of the subjective factor in the experiencing of a situation is indeed the fundamental feature of the human situation. There must be detachment not only from the containment and limitations of the cultural and family matrix (operating in terms of the collective psychism of the society and its particular cults, religion, and integrated group-behavior) but also from the usually even more compulsive power of biological instincts. Both types of "liberation" are essential if true individual selfhood is to develop, and its desires and will are able to become controlling factors in human experience. A third kind of liberation is necessary at the end of, as well as throughout the process of transformation called "the Path," if the super-individual state of Pleroma is to be reached. It is a liberation from the desire to retain a consciousness of separateness as an individual, where separateness means the desire to act according to "my own pleasure" rather than as the evolution of the whole of humanity demands. Acting in terms of the evolutionary need, not only of humanity but the whole planet considered as the Earth-being within which mankind fulfills a definite function, is not what is usually called "altruism." Altruism is a horizontal kind of relationship. The relation of the narrowly focused and individualistically defined person to the "greater whole" represented by the Earth-being and particularly by the Pleroma constitutes a vertical type of relation. I have dealt with the distinction between horizontal and vertical relationships in Rhythm of Wholeness (Part Four, chapter twelve). I shall return to it briefly in chapter six when more fully explaining the meaning I give to the term Earth-being, indicating in broad terms the quality of subjective desires which impels an individual person to accept the long and arduous process of metamorphosis leading to the humanhood-transcending Pleroma state. At this point the basic fact which must be stressed in the approach to experience I am presenting is that three factors operate in all experiences. The subjectivity factor is only one of the three. The subjective realization of selfhood — even the subtlest I-feeling — not essentially external to the experience which a particular situation engenders; yet at the human level of existence, what comes to believe itself the experiencer of the experience has had the power to detach itself from the wholeness of the experience. The experience as a whole is triune. It affects and to some extent changes a whole of being; and for this reason I speak of the "holontological" way of understanding experience (from holos, whole and ontos, being). In every phase of the Movement of Wholeness, "being" can experience its fullness. But the level of the experience and the scope and quality of the consciousness of fullness of being differ at every stage of the cyclic process. As the factor of subjectivity changes, so also does the manner in which the formative mind operates and the nature of the power whose release makes the experience possible. In current usage, the word experience is in most cases restricted to the level of activity and the consciousness of human beings. The experiencer is a "person," Peter or Jane; and the experience involves the three above-mentioned factors: a subject, a mind, and a body able to release power through biological processes. Yet usually, and even in a philosophical and religious sense, the subjective factor in the series of daily experiences a person calls his or her life is somehow singled out and identified with the whole person. This person knows himself or herself as "I." But can there be an "I" without an experience, if we give the word experience its largest meaning? Nevertheless, we are accustomed to give to experience a narrow significance. We reduce it to the human level at which personhood develops; we identify the subjective factor in "our" experiences with the whole person of which we assume "I" is the independent and at least essentially transcendent subject — in religious terms, the individual Soul. The result is, I believe, a fundamental kind of psychological confusion, unavoidable as it may be in a period of transition between two levels of being. In the next chapter I shall attempt to show how the operations of the three basic factors in experience can be at least broadly or abstractly envisioned throughout the entire cycle of Wholeness. We shall then be better able to give to personhood its fullest and most essential meaning. It has such a meaning in the Supreme Person whose appearance in the field of existence of the Earth-being occurs at the symbolic Noon of the Movement of Wholeness when the rise of the principle of Unity begins. Yet this prototypal meaning will only be realized in the fullness of human nature on a transformed earth, when the human cycle ends and the Pleroma of the Perfect — the seed remnants of our humanity — pursue their evolution in a realm of being in which the drive toward a state of all-inclusive Oneness increasingly yet never absolutely overpowers the trend toward Multiplicity.